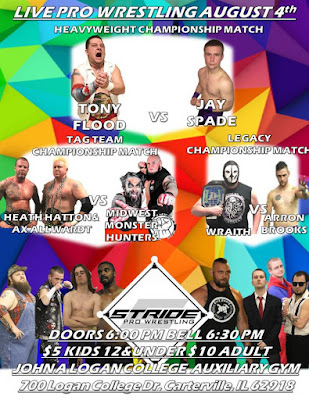 Stride Pro Wrestling returns on Aug. 4 to John A. Logan College in Carterville. I've mentioned in a previous blog that all three championships are on the line. Tony Flood defends the Heavyweight title against Jay Spade, Wraith puts the Legacy Title up against Arron Brooks and Ax Allwardt and Heath Hatton will defend the tag titles against the Midwest Monster Hunters. I'm excited to announce another match has been set for the evening. There will be a battle royal to establish a new number one contender for the heavyweight title. Spade and Flood have been going back and forth, trading the title a few times along the way since March. The battle royal Saturday night will put someone else new in the title picture. Like most Stride battle royals, the competitors on the undercard will all be a part of it. I'd expect to see the likes of the above-mentioned wrestlers along with Chris Hargas, Cash Borden, Farmer Billy Hills, Roger Matheus and the DR Party as part of the action. Again, bell time is 6:30 p.m. in the Auxilary Gym at John A. Logan College in Carterville. Keep up with what's happening in Stride Pro Wrestling right here.